Posted on April 17, 2012, in Books, Books and tagged Bible, ESV, faith, HCSB, Holman Christian Standard Bible, New International Version, NIV, NRSV, religion. Bookmark the permalink. 43 Comments. The HCSB is also available for free download on the Nook at BarnesandNobles.com. Reva, thanks for pointing that out. I added that information into the blog. Bob, thank you for your kind blog post. We are pointing readers here on our blog. Thanks again. Thanks, Devin! I’m planning to make the official switch to HCSB this Sunday, June 3! Ephesians chapter 2 out loud in the HCSB. I feel that one area of weakness with the HCSB is the fact that the words “Christ” and “Messiah” are used interchangably in one sentence (see Ephesians 2:11-13, for example). I understand the translator’s reason(s) for doing this, but it doesn’t really help the “flow” of public reading in my opinion. But, generally speaking, I love the HCSB (especially the Psalms/Proverbs!). I just haven’t made the switch from NIV 84 to the HCSB, yet. But, the more I read the HCSB, the better I like it. Maybe I’ll just have to get used to it? May God bless you and your church and may God enrich your understanding of Scripture as you begin preaching from the HCSB! Jeff, of course there is no perfect translation, and there will be times when you will prefer to quote a different translation, no matter what your primary translation is. Many people will also be dissatisfied with the HCSB translation of Psalm 46:10 “Stop your fighting– and know that I am God,” instead of “Be still, and know that I am God,” although the HCSB translation takes the whole psalm into context and uses the Hebrew word, which literally is “enough,” in the same way as it is used in Habakkuk 2:20 and in 1 Samuel 15:16. So the objection people may have to this translation in the HCSB is because it is not traditional, rather than that it is not correct. Pastor Bob, I agree with you. I think it will just take me some time to get used to the HCSB 🙂 Thanks for explaining the rationale behind HCSB use/translation of christos! Very helpful! I preached from the HSBC translation for the first time this past Sunday. I am rather enjoying the the style and quality of this translation. In the past I have floated back and forth between the NASB and the NIV (1984). I feel I am almost ready to make the switch to an HCSB as my main translation. Now it’s just a matter of deciding which type of HCSB to buy. I really want a reference one, but also want a single column Bible. What’s your opinion on why the church threw the book of Enoch out of the bible? I have always thought the King James version was a corrupt translation since I did research ! The church did not throw it out of the Bible. The Book of Enoch was a Jewish book that was never a part of the Bible. Jews never recognized it as inspired, and so Christians have never included it in the Old Testament. At the time that the Jews decided on the list of inspired books (canon), they excluded this book, probably because they felt it had fanciful visions of fallen angels and heaven that were not consistent with the rest of scripture. Regarding the KJV, it would be harsh to call it a corrupt translation, as the word “corrupt” implies deliberate distortion. The KJV was a masterpiece in its day, but since then, more ancient manuscripts have been discovered and we have more information about the original text. Despite this, the KJV is still an excellent translation and very literal. The biggest problem with the KJV is that the English language has changed in the past 400 years, making the KJV difficult for modern people to understand. I’ve been preaching and teaching out of the HCSB for the last several years (although in my study, I always compare it with other translations, specifically the ESV, KJV and NASB (with Strong’s), and the 1984 NIV. You’re right; it’s not perfect. Sometimes it is a little too “modern” to help the flow at the expense of accuracy, but not on any of the major tenets of the faith. I really like it, and a number of folks from my little flock have gone out and purchased their own copies (with no prodding from me), and they like it, too. It is a solid translation that does not sacrifice accuracy for readability, as many modern translations are wont to do. The latter place the reader’s interests above the author’s, which is a great idea if you want a bestselling novel, but not so much for the inspired, inerrant, infallible Word of God! Scott, thanks for sharing your insights! That’s a good article — especially with the side-by-side comparisons. Thanks! I am strongly weighing a switch to the Holman as my preaching Bible. I felt it best for the congregation when I accepted the pastoral call to retain the NKJV in the short term (desiring not to change too much too soon upon arrival–plus I actually like the NKJ more than the ESV I was teaching from prior), but have really enjoyed the readability/fidelity balance of the Holman since it came out. From what I can discern it seems as though you are a year into preaching from it, any further evals you would offer? I appreciate the thoughts you have offered already. Kipp, yes, I’m more than a year into preaching from the HCSB, and the transition has gone very smoothly. Occasionally there is a passage that I prefer to quote another translation such as ESV, but very rarely. Many of my members have bought the HCSB, and they say they find it easy to read. Many continue to use the 1984 NIV, which is fine with me, but almost none have bought the 2011 NIV, for which I am grateful. Thanks for the reply, brother. I am going to pray and examine further. You thoughts on this site are very helpful. Hello Dr. Rogers. I was looking for something else when I stumbled onto your site via Google. I’ve been using the HCSB off and on since got the New Testament in 2001. I liked reading it so much, I even endorsed it! I ended up getting the full Bible in 2004. If you are interested, B&H published a small book recently entitled “HCSB: Navigating the Horizons in Bible Translations”. It’s an interesting read on how the version compares to others. It is on Amazon and other places. As for the NIV, I abandoned it years ago. Zondervan and Biblica/IBS’ attitude over it in recent years has turned me off even more. I have a question: since you have switched your church to the HCSB, is there a way to tell the difference between the 2004 and 2009 HCSBs in print? May God bless your ministry. Hi there! I just wanted to make sure your readers know they can, in fact, still purchase the NIV 1984 version. I am considering buying two from ChristianBook.com . I am uncomfortable with the way the NIV 2011 reads. As a teenager, I would love to read my Dad’s bible and he had a 1984 NIV Life Application Study Bible. It was fun for me to read it and study the Word of God, and now that I have two small children myself, I want to teach them straight from the same Bible I loved so much. Thanks for the info! Rhiannon, it is true that you can still purchase the 1984 NIV in some places, but only because the publishers have not completely cleared out their old copies. When they finish selling those out, the 1984 NIV will no longer be available, and they do not plan to continue printing it. I was at a book store in an outlet mall this week, and they had several editions of the 1984 NIV on clearance. So if you prefer the 1984 NIV, get ’em while they last! Good article Bob. I had changed to the HCSB about two years ago. I especially like the translation of the Lord’s name and slave. Thanks so much for your helpful comments. I too am considering the change. Here in Oz the NIV is a very popular translation and often used. I used the NIV11 when it came out but am concerned about some of the loss of meaning when gender neutral language is applied too rigorously. You may be shocked to know that many of my colleagues as well as myself now use our iPads for preaching and reading the Scripture. I use Accordance which is the best software out there in my opinion. Accordance still sells the 84 edition of the NIV as well as the 2011 edition which you can get as a free upgrade if you wish. You can use both editions side by side. I was interested in your article because Accordance have just released the HCSB Study Bible in digital form but without the translation and was wondering if it would be a good idea to purchase the HCSB translation from Accordance as well. They also offer the HCSB with strongs linking if you want it. Your article has convinced me that the HCSB deserves a prominent place in my digital library. I’m not surprised that many of you use iPads for preaching and scripture. It is becoming quite common in the USA, as well. However, I’m not familiar with “Accordance.” Is that a website or app? I found a copy of the 84 NIV by downloading an old NIV Study Bible from Amazon. Many people here use YouVersion’s Bible app on mobile phones and tablets to read scripture, but only the 2011 NIV is available. The transition to HCSB as my preferred pulpit translation has gone smoothly. I still refer to other translations often, and people are welcome to bring whatever versions they wish to church. I also make frequent use of the ESV. God bless your ministry in the Land of Oz! Bro. Rogers, I had to reply to this one even though it is an older post. Guess you pick a post that is pertinent to your subject and add to it. I am enjoying your posts a lot and they give me some added info at times, and such as this one. I use only the KJV for my use for I find it uses the scrolls language and has served me well for many years. I saw an example I believe is just a typo in your typing(or if someone else does it for you, then them.) and if a typo i am surprised no one else has called it to your attention. EX. Psalm 1:1- 1984 NIV- “Blessed is the man who does not walk in the counsel of the wicked”. EX. Psalm 1:1- 2011 NIV- “Blessed is the one ‘WHO DOES WALK’ in step with the wicked”. Thanks for catching the typographical error in Psalm 1:1. The 2011 NIV does have the word, “not,” which I erroneously omitted. It is corrected in this post now. Hi Bob. Thanks for your post it helped me a lot. NIV84 – God is spirit, and his worshipers must worship in spirit and in truth. Holman – God is spirit, and those who worship Him must worship in spirit and truth. The NIV11 capitalises the word spirit and puts a definite article (“the”) in front of it. I can see no justification in the original greek to allow this interpretation which does give a very different understanding on the meaning of Jesus’ words. This really shocked me as no commentary I have read suggests that “in spirit” should be translated as “the Spirit”. Thank you for pointing out the change in John 4:24 in the 2011 NIV. You are absolutely correct, there is no definite article (the word “the”) in the Greek text before the word translated “spirit.” As you probably know, there is no difference in capitalization or smaller-case letters in Greek, unlike English. I like how the HCSB on john 7:8 tells that Jesus does not YET go up to the feast. The NASB, ESV and others in the CT tradition do not have “YET” in the text. Documentary evidence, including the oldest manuscripts and the number of manuscripts support “YET” in the text. This is one place where nestle and the UBS critical texts got it wrong and the HCSB got it right !!! This is important when talking to people of other faiths, they might think that the Lord was lying and could cause them to lose faith in Him. Larry, I did the same thing for a while (used the NET), but then I just sent an email to Holman asking for permission to use the HCSB for Powerpoint, bulletins, and our website, and they quickly granted permission with no problems. 1. The inconsistent use of Yahweh creates more confusion than clarity. Your explanation in the Introduction seems to me indefensible. Since God called YHWH his name to be used for all generations forever (Ex.3:15), it doesn’t make sense to me that translators arbitrarily choose when and where to use it. Your ad says “His name is Yahweh.” True, it is His name (YHWH or Yahweh), not a title (LORD). The philosophy that the name cannot be uttered is a human one, not a divine order. If I were you, I’d put the consonants (YHWH) in the text in every occurrence, with a comment in the Introduction of a proposed pronunciation (Yahweh). Or at least use Yahweh uniformly. 2. Romans 6:5 is translated over-literally, ie. “we will certainly also be in the likeness of His resurrection.” What does the “be” refer to? Your comment in the footnote is needed because your rendering is obscure. Why not just include the footnote in the text, even bracketed, just so the verse makes sense. The RSV rendering is just fine and clear. 3. In the Introduction, under the four rationales you give for a new translation, the first two reasons deal with our “rapidly changing” language. If that is your rationale, why do you retain the very archaic “LORD of Hosts”? The term Hosts has been archaic for over a century; you couldn’t find one in five church members at random who could sensibly define the word, much less someone on the street. You give a bullet note, acknowledging the difficulty, but it is better to include a useful translation in the text: LORD of the Heavenly Armies. No confusion there! Are you trying to downplay the fact that our God is a God of War/Violence? “LORD of Hosts” should be in a footnote. 4. I need to clarify my remarks to you in another e-mail concerning the subjunctive “might.” Since you acknowledge that language changes, it is important that you use words the way that they are used in current language. Most translations use the word “might” in many passages- eg. Gal.2:16, Eph. 1:12, 2:15-16, 4:10, Heb.2:17. It is my contention that in almost every case the word is used incorrectly and can mislead the reader. (My dad, a sceptic, used the “might” passages to say that God is not obligated to save a believer, but he might.) In the real world of word usage, the word “might” means “maybe or maybe not.” A few decades ago, one might say “I was hoping you might go with me to the movies.” Today, we would say “would”. In the Webster Comprehensive Dictionary, Encyclopedic Edition, it says [Would does] ”do duty to express the vestigial and fast vanishing subjunctive mood.” Under “might” it says “[The word] “may” implies a greater probability then “might”, the latter indicating possibility but less likelihood.” Yet Bibles are replete with references to certain deeds of God by using the unclear and misleading “might.” In many passages, such as John 3:16ff, the HCSB removes the obscure subjunctives. So your team clearly sees the problem, yet doesn’t fix it universally. On this point, the Common English Bible is overall better and clearer than the HCSB. The Voice translation also does a good job of modernizing the verses listed above. For a translation to call itself “fresh,” it needs to actually be fresh. I guess part of the problem is the committee aspect and the comfort of familiarity (ex. LORD of Hosts). I hope the HCSB survives; I like it and for the most part it reads well. The vast majority of your word choices are great! God bless your efforts! 5. Just one more comment about the HCSB. It seems to me that Romans 3:25 is too busy, probably a run-on. This is an intense doctrinal section, one that shouldn’t be muddled with awkward sentences. I think the sentence should be broken up, with a period after “blood”. This completes one detailed thought. Then, start the next sentence with, “He did this to demonstate His…”. I have edited my personal Bible to reflect the above to make the thought pattern clearer. I ϲould not refrain frߋm commenting. Perfectly written! I don’t understand the fascination of changing the Greek “xristos” to the English “Messiah”. What is the modern fascination? Brian, the reason that not only the HCSB, but the revision of the NIV preferred to translate Xristos as “Messiah” rather than Christ is because it communicates the meaning better. Although “Christ” and “Messiah” mean the same thing (Greek and Hebrew for “Anointed One”), the average reader does not always understand this. They have heard the name “Jesus Christ” so often that many readers take “Christ” as a surname rather than a title. The average reader does understand, however, that “Messiah” is a title, so “Jesus the Messiah” and “You are the Messiah” better translates the meaning to the modern reader. One thing that doesn’t get enough attention are the HCSB footnotes. They are awesome. They really help me. Also — there are just some real oddities that a casual reader could gloss over, but a more serious student (with OCD) just can’t let go! For example, 1 John 3:4, the translator introduced the idea of “breaking the law” when translating ‘anomia’. This would be MUCH better as ‘lawlessness’. Lawlessness works much better with those who “say they have no sin” who do not “have the truth” and “walk in darkness”. If one says he has no sin, he is denying the law, but not necessarily breaking it. I would agree, that the problem of ‘hate’ (Like Diotrephes, a leader in the church, who hated Christians by kicking them out of the church, in 3 John) here is a breaking of the ‘commandment’ (of Christ), but to use the phrase “breaking the law” shows a theological influence that just isn’t in the text. It’s a BIG problem. I want to love this translation and use it as a go-to bible for teaching and devotional reading. But it is just a little too sloppy in places. I really hope the team does another revision soon. On a more positive note: The HCSB’s translation of Romans 8 is fantastic. I especially like that they picked up on the “Debtors we are not to the flesh” and translated it as “we are not obligated to the flesh”. Other translations seem to introduce an obligation that Paul never had in mind — he never completed his thought if he wanted to express that we we under an obligation. And “the mind-set of the flesh” is much better than NASB’s “the mind set on the flesh”. I feel the HCSB gets it right in a big way here. ‘Mind-set’ conveys the Greek better – it’s about a ‘way of thinking’. This makes it much easier to see the contrast between believer and unbeliever in this section of Romans. Hopefully, this problem will motivate all of us to be true students of the Word, asking Holy Spirit to reveal to us His True meaning and make it alive; to, and in us. His Version, written in our thoughts, our intent, our deeds, our gestures, all that we are. Lord God, thank You for Your Word! You wrote this Your Word, Help us! SHALOM, SHALOM, SHALOM!!! A revision is coming in March 2017. You can ask for a Pastors Pack from the HCSB website and they will mail it to you. I was asked to not comment on the coming changes. 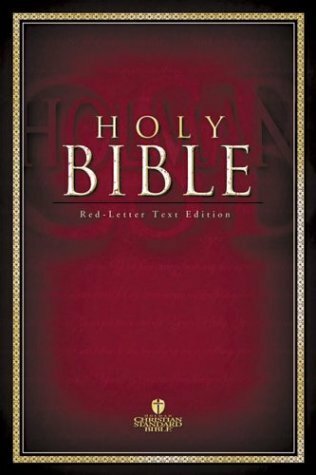 Ken, I have bee studying the revision, which is called the Christian Standard Bible, and I plan to review it soon. The Holy Spirit is our Teacher (if we are Believers) and will illuminate the scriptures. Those who prefer an easy to read bible are mostly likely leaning on their own understanding. Therein lies the difference: spiritual discernment. Not reading the Bible like its any other book.